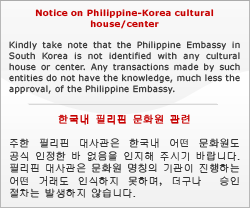 The Philippine Embassy in Seoul announces that the following registered overseas voters who have notified the Philippine Embassy at email address [email protected], of their intent to claim/ pick up their Official Ballots for the 2019 National Elections, are hereby advised that the Voter's Mailing Packets can be claimed at the Philippine Embassy from 13 April 2019 to 13 May 2019, from 9:00 AM to 6:00 PM. 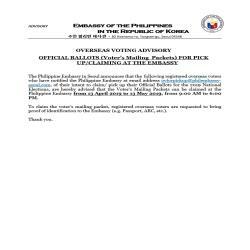 To claim the voter's mailing packet, registered overseas voters are requested to bring proof of identification to the Embassy (e.g. Passport, ARC, etc.). DEL ROSARIO, Sheila Mae B.